Learn more about our Elite Baseball Program! 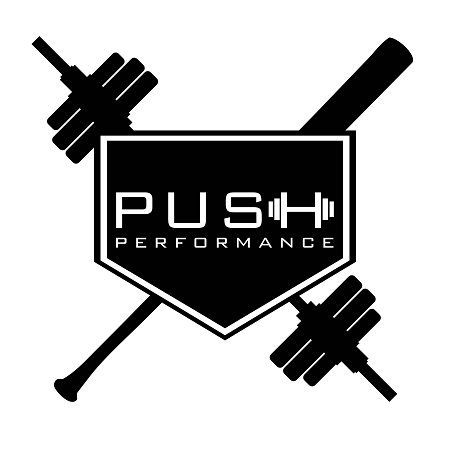 In this weeks episode Austin interviews, DJ Edwards, who is the co-founder of Push Performance in Highlands Ranch, Colorado. The FitAdult Strength and Conditioning Class program is designed for adults wanting to compete with themselves. It is an intense program that will be as close as you can get to being back in college with strength and conditioning coach! We incorporate Olympic lifts, power lifting and all around strength and power. Come train where the pros train! We have a trainer that matches up to almost any need of a client. The trainer will help you develop a personalized program and nutrition guide to help you meet your goals. These sessions are by appointment with your selected trainer. This is a great fit for our tri-athletes, marathon runners and other endurance athletes. We will breakdown running form and stride length and correct the your biomechanics. This is the program that has put us on the map. Our head of baseball operations, DJ Edwards, has worked with over 100 baseball players from all over the nation in our Elite Baseball Program. This is a perfect setting for professional, collegiate, and high school baseball athletes to make tremendous improvements in the off-season. While working side by with other athletes you are able to develop your game with personalized throwing programs, speed and agility programs, hitting instruction, and Strength and Power Development. All athletes of all sports, from elementary school to weekend warriors love this program. We mimic the atmosphere of a college or professional weight room to prepare each athlete for the next level. Each athlete in the group is given their own individualized program and trains while a coach supervises each workout. Coaches are available for questions at all times during this workout option. Each athlete will work with head of Soccer development Bobby Layburn in this program. The program targets speed, agility, strength, power, stability, mobility, and injury reduction. He also works on players IQ, ball skills, passing, and shooting for all levels, from recreational players to pro players of all ages. He runs his athletes through in season and out of season programs that are individualized specifically for the athlete. Recruiting advice for college and professional clubs are included in the program. Rod English and Megan Casey each have their own way of prepping athletes for Body Building and Physique shows. With an extensive knowledge in nutrition and muscle hypertrophy they will answer all of the questions you may have while training to get on stage. They work one on one with each athlete to develop exactly what their body needs from day one to the days after their show.